2019 is here, and STEM modules are near! Late last year we moved our workshop (not far… still in Brooklyn), which delayed product development, but we are now back in action. Expect LFOs popping up for sale in the next month or so. Had an amazing weekend at KnobCon. Met so many great people, and got a lot of lovely feedback on the STEM Modular gear. Even got some shout outs on the interwebs, which you can check out below! The magic of math and synthesizers. An all-time favorite clip of an all-time favorite artist. I recently found this website full of beautiful animated illustrations. From modular synthesizer to how speakers make sound, Animagraffs are really providing a great service. Totally gorgeous and incredibly helpful. I’m really excited to share STEM Modular with you; a project I’ve been working on for the past few years. As some of you may know, I completed an electrical engineering degree in 2015 after almost 6 years of studying. This was not even a little bit easy for me. I struggled with math and science in my youth, and was even specifically discouraged from pursuing an engineering degree based on my academic performance. Fortunately I developed an interest in electronic music production, and was able to eventually digest an engineering curriculum in the context of drum machines and music synthesizers. It didn’t make the work any easier, but knowing where that effort could lead made a huge difference. 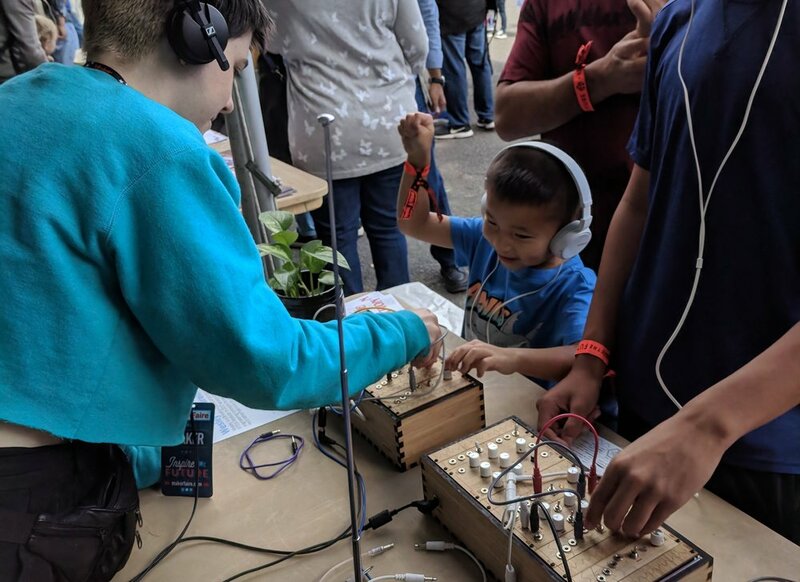 Through my experience I began to wonder if there were other people like myself, interested primarily in being creative, but able to tackle science, technology, engineering, and math (STEM) concepts through something fun, like making music. Electronic music stands out particularly, mostly because I find recreating a Timbaland bass line quite enjoyable (maybe I’ve watched Magic Mike one too many times), but also because behind a simple knob twist there are direct correlations to more technical concepts. 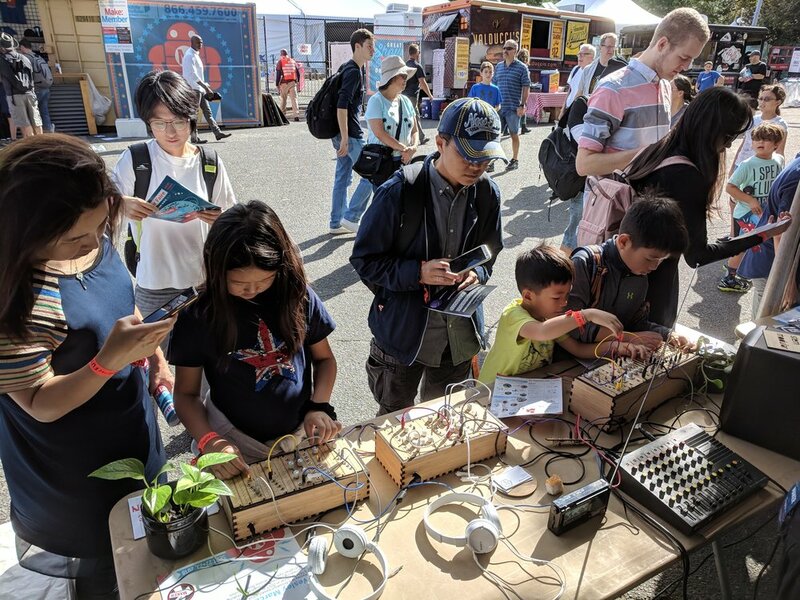 STEM Modular approaches electronic music through modular synthesis, which is a way of making music with audio building blocks, creating a custom instrument by connecting modules together however you choose. It is more complex than strumming a guitar, and looks like it might belong on a primitive spaceship, but it provides maximum creativity and distills music down to its core components. The aim is to present STEM in a playful and empowering way, to ensure that STEM careers (and paychecks) aren’t limited to those that can afford fancy schools and tutors. We all use electronics everyday, yet the people developing these products and technologies largely come from similar backgrounds. An inclusive approach to STEM that reveals real world applications can lead to a more diverse workforce and democratize technological advancements. I know that despite my best attempt to explain all of this, it might still seem a little abstract. If you’re interested in learning more, I’ll have videos and sounds and images popping up very soon that will add clarity, and hopefully be entertaining too. 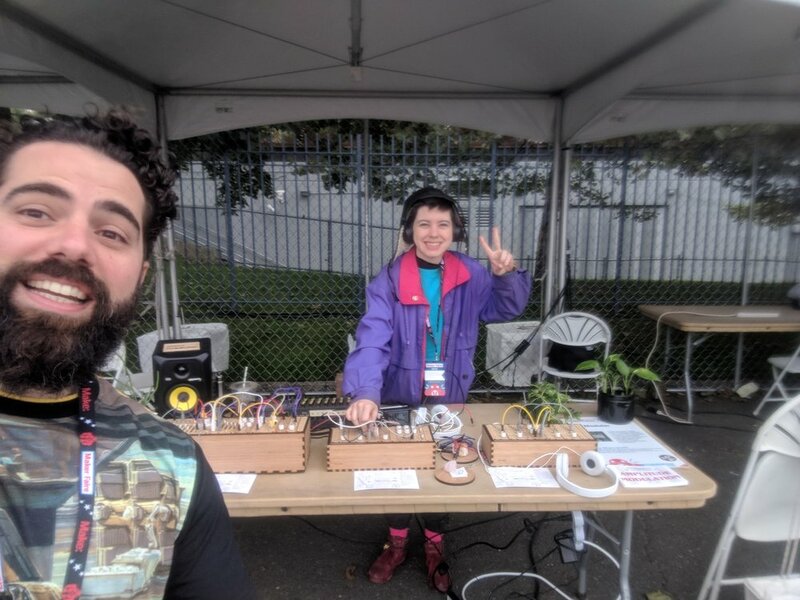 A large part of STEM Modular will be workshops and programming for libraries, community centers, and art spaces (anywhere a fresh take on STEM can be helpful), so if you are an educator or know of a venue that would like to host an event, let’s talk! Thanks for reading this long post, and hopefully I’ll get to show you some of these gizmos in person very soon! A few years ago I bought a bunch of solar cells that had been harvested from broken solar panels. I have used them to add light control to synth projects with basically zero environmental impact (using trash to generate a voltage from sunlight). Each cell provides up to 0.5V, and I have used up to 5 cells to generate approximately 0 to 2.5V. 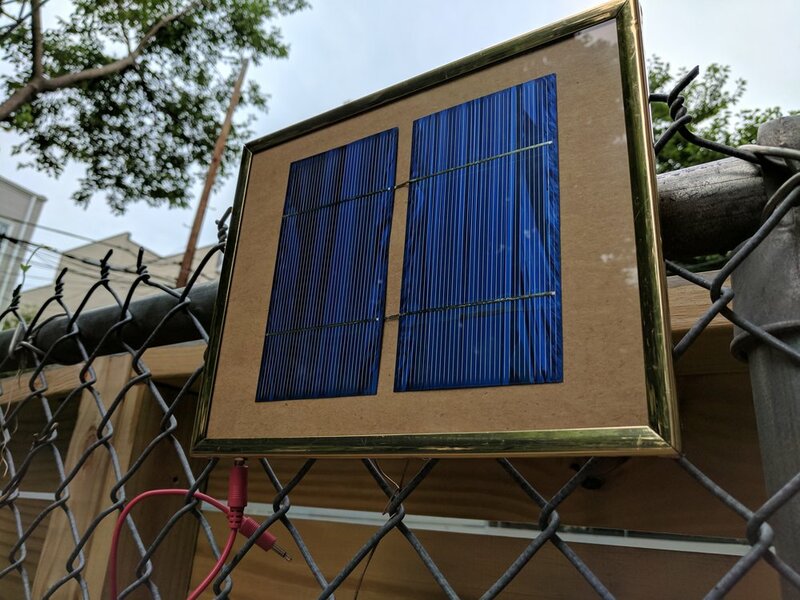 Recently I combined two cells in a junk 8.25"x10" picture frame to provide ~0-1V of control voltage in a compact and relatively sturdy package (the solar cells are VERY fragile, so if you can solder them together without breaking them it is a good idea to package them safely). Two solar panels framed with output to a 3.5mm jack. Generating 0.32V on a cloudy late afternoon in July. Connecting the solar cells is fairly straight-foward, though their fragility can make things a little tricky. Each cell gives a maximum of 0.5V, and to generate higher voltages we connect the solar cells in series. If we consider the blue side to be a negative potential and the grey side to be positive, then to connect them in series we connect the negative (blue) of one cell to the positive (grey) of the next. Now when we place the positive lead of a voltmeter to the positive lead of the first cell, and the COM lead to the negative of the second cell, we will see a range of 0V to 1V (of course depending on lighting). Front of solar cell. The metallic strip running across is soldered to the back of another solar cell to connect them in series and generate higher voltages. Back of solar sell. Metallic strips are soldered to pads which ultimately connect to the strips on the front of another solar cell to generate higher voltages. Continuing to add cells in series we create even higher voltages. The max I have done is 5 cells for a performance where I placed the cells inside of a box and controlled the pitch of a homemade synth by opening and closing this box. Solar box. Control voltage changed by opening and closing the box. Semiconductors (the stuff that makes up transistors, diodes, integrated circuit chips, LEDs, and solar cells) are composed of special chemicals that are really good at moving electrons around. A very common semiconductor is Silicon, which is "doped" (chemically bonded) to other chemicals, giving it a tendancy to either accept or reject electrons. In a dormant state, the semiconductor creates a barrier between Silicon that is doped to have extra electrons and Silicon that is doped to "want" electrons. In a solar cell, photons from the sun create a bridge across that barrier, allowing electrons to flow from excess area to wanting area, generating a voltage. Somewhat related, the opposite occurs when a voltage is applied across an LED, generating photons. While I enjoy using modular electronics to create ambient environments and harsh noise experiments, I really just want to make fun beats. This can be difficult depending on what equipment you have, especially if you want to add variety or develop song structure. A couple years ago while working at Verbos Electronics, I was talking drum machines with Mark and he recommended sampling the trigger output of my TR-626 onto my Akai MPC in order to expand my modular beat making abilities. Since doing this I have been using my MPC 1000 to trigger events throughout my modular system, and with standard 6 outputs on the 1000 it really adds a lot of variety. Currently I am using one output to advance my Verbos Voltage Multistage and another to trigger its strobe (reset), the other outputs are used to trigger envelopes and percussion modules. Below is a track I made with this setup.